Here in Port Stephens there are a great range of activities for children of all ages during the school holidays Monday 1 October until Sunday 14 October 2018. Are you looking for Vacation care in October 2018? Vacation Care provides programmed activities, learning experiences and excursions for school age children from 4 -13yrs. Find out more about Vacation Care. Contact our Children's Services Administration Office on (02) 4988 0308 or childcare@portstephens.nsw.gov.au for more information and to request enrolment forms. We are pleased to announce our October 2018 school holiday program. Bookings are essential for all activities as places are limited. You can contact the library or follow the links below for more information. A photography exhibition covering three series' of work spanning 2017-2018. Kerb Appeal is an exploration of the mundane and the sculptural beauty in discarded things. Black Velvet and Silk are the result of experimentation with light and movement. Find out more about Art Space exhibitions. Check out everything that's happening around the Port Stephens area. We've got information on community, cultural and Council events. View the Council and Community events calendar. Stardust Circus on 1 October 2018. Nature is fun Children's Activity from 10:30am on 3 and 10 October Hunter Botanical Gardens. Murrook Cultural Centre school holiday cultural workshop Friday 5 October. Contact Vicki on (02) 4033 8804 or email vicki@worimi.org.au. Sydney Sixers 'Beach Blast' on 5 October 2018. Raymond Terrace Market Place school holiday activities. If you are looking for walking trails, or things to do visit the Port Stephens Tourism website. Enjoy these exciting activities at Robinson Reserve located on the corner of Robinson and Fitzroy Streets Anna Bay. Port Stephens Visitor Information Centre friendly staff will help you make the most of your stay in Port Stephens. Find out more about where to stay, events that are on and what to do while in Port Stephens. Help burn off some of the kids energy on their skateboards, scooters and BMX. Council has seven skate parks that cater for beginners to skilled riders. All skill levels are equally entitled to use the ramps, however skate parks are not an appropriate place for toddlers using mini-bikes or toy riders. Schools are the heart of our communities and offer a range of quality recreational and play facilities. Over the coming school holidays, the NSW Department of Education is rolling out a program at 167 schools across the state which will open up the playgrounds, ovals and sports fields for the whole community to enjoy. To find out which schools in Port Stephens are involved, please visit the schoolinfrastructure.nsw.gov.au or contact them on 1300 679 332. Have fun on the water, there’s something for everyone at one of the Port Stephens aquatic centres. Remember swimming is a year-round activity. Our swimming pools are top quality in the state, ranking high safety scores in NSW. Did you know there are free swimming lessons available? 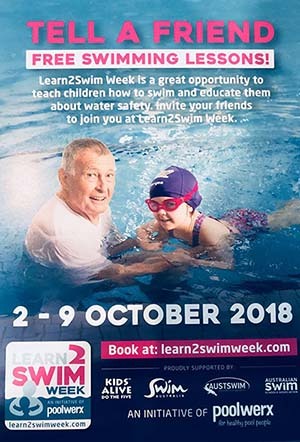 Learn2swim week 2-9 October 2018 is a great opportunity to teach children how to swim and educate them about water safety. Invite your friends to join you at Learn2Swim Week. Nelson Bay Fitness - personal trainer. Please contact Trudie Blachford on 0402 838084 for session times and details. Port Stephens Surf School - The Surf Groms program is running each week of the October school holidays. Find out more about Surf Groms. Find out more about the commercial operators in Port Stephens. Port Stephens is home to numerous and picturesque reserves and parks ready for you to explore. There are numerous playgrounds, public amenities, open spaces and picnic facilities across the region making the area a perfect place to live or visit. Find out more about our popular parks and reserves. Port Stephens has a variety of beautiful beaches, foreshores and reserves on offer with large patrolled beaches ideally suited for surfing and small enclosed beaches perfect for a family picnic or get together. Port Stephens Council contracts professional lifeguards from Surf Life Saving Services NSW to provide weekly patrols for Birubi Beach and Fingal Beaches with a 7 day per week patrol (including public holidays) at One Mile Beach. Take the kids out on their bikes along one of the cycling tracks in Port Stephens. Port Stephens has designated cycleways that provide safe cycling around the peninsula, taking you from Salamander Bay right through to Fingal Bay with some spectacular waterviews as you pass from Bagnalls Beach to Dutchies Beach to Nelson Bay. There's some shaded riding through bush and reserves from Shoal Bay to Fingal Bay and plenty of parks, playgrounds and cafes along the way. Find out more about the long and shared cycleways in Port Stephens. Take the dog out for a walk. Port Stephens has numerous parks and reserves where dogs may be exercised off-lead. Find out where you may exercise your dogs on/off leash and the dog prohibited areas. Parents and caregivers play an important part in teaching their children about road safety. Children learn largely by experience, and as parents and carers we have regular, daily opportunities to discuss road safety with our children while on the way to the shops, park, beach or school. When crossing the road, talk about where and when it is safe to cross the road…….and why! 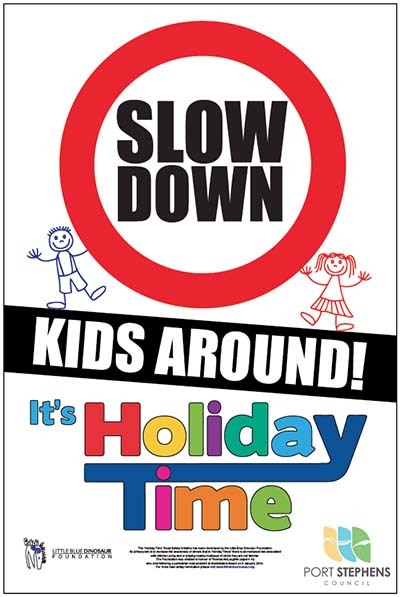 And for the motorists out there, please slow down when children are around.